I love iced coffee. Iced mochas, to be exact. I make myself drink hot coffee at times in the winter, but I would always rather have it iced. 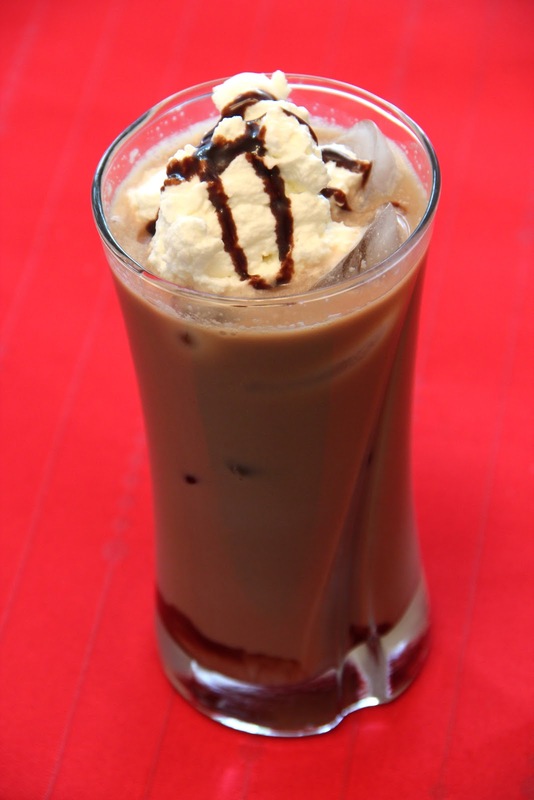 The problem is I could never figure out how to make a good iced mocha at home. They always were too watery or too bitter or just gross. However, I have now discovered a delicious recipe for homemade iced mochas. I can't tell you how much I've enjoyed making a good iced mocha at home instead of going to Starbucks and spending over $4 each time. You probably already have most or all of the ingredients in your kitchen, so go whip one up. It will cure those Monday Blues. In the bowl of your electric mixer, add 1/2 cup heavy cream and 1 Tbsp sugar. Beat until peaks form and you have the consistency of whipped cream - about 6 minutes. Fill the bottom of your glass with 1 Tbsp of chocolate syrup. Pour in the coffee, then the milk, then the vanilla, then 1 Tbsp heavy cream, then the brown sugar. Mix well with a spoon. Add ice cubes. Top with whipped cream and additional chocolate syrup, if desired. Serves one. *I brewed a pot of coffee, let it cool, then put it in a pitcher in the fridge. Let it sit in the fridge for hours or even overnight to make sure it is really cold before you make the mocha. **Unpacked brown sugar if you don't want it super sweet; packed if you like it sweeter. I pack mine. Obviously. I need one of these right away! Coffee and delicious! YUMMM! I'm not really a coffee girl... in fact, I can't really drink it. however, i LOVE tea. I'll drink a hot tea every morning. then, if it's hot outside, I'll make an iced tea too. but i struggle with having it be too watery too. That's what I need right about now. Oh, I love coffee...this looks too good! Yum! WOW Sheri this looks delicious! yum! I used to be a barista so I LOVE making my own coffee concoctions. This looks super yummy. I'll have to give it a go! I love this, Sheri! Ja-Yo! Iced coffee is the BOMB! YUMMY! Yum, I need one right now. They look sooo good! I'm a hot tea drinker all year round, but it wouldn't take much persuasion to get me to slurp one of these beauties down! Great recipe! good stuff. must try it. I just pinned this! That sounds amazing, the only problem is I don't want to have to wait for my coffee to cool to try it. Your blog is so cute! Definitely going to have to try this drink recipe soon :) Sounds delicious! i hate coffee or anything coffee tasting, but everytime i see a pretty iced coffee like this i wanna try it SOOOO bad!!!! hope you had a great weekend girl! This sounds right up my alley- can't wait to try! Been wanting to try iced coffee this summer! I cannot resist an iced chai when I go to Target -whoever put Starbucks in there is evil! :) Thanks for the recipe! You always post the best looking recipes! I love cold coffees, so I'm gonna have to try this one! I didn't know you could make them at home! Since I'm on vacation, I'm trying not to down my coffee as I would at work. Iced Coffees are SOOO good though, if I have a slow morning, I whip up one and savor it! I think we all sound like drug addicts. I haven't had a mocha one in awhile, maybe I'll try this one!